Many place names, and their elements are confusing, contradictory and unclear. As we've seen, 'léah' can mean both wood and clearing in a wood, 'tún' is a homestead, farm, village, or estate', 'port' can mean port, market or gate, 'holmr' can mean island, or raised land in a marsh. That might seem to explain Rusholme but this is said to be 'risc + um' (dative plural), place at the rushes. Rochdale appears straightforward: Roch is the river and dale is the valley it flows through, but it's not as simple as that: Rochdale comes from Recedham - 'homestead with a hall', and over time, the m changed to l. To confuse matters further, the river Roch may have its origins in a Celtic word meaning 'opposite the wood' *rac or *ceto (the asterisk means the word has not been found in writing and is assumed to have existed), the wood being Rossendale, another name marked 'etymology doubtful' but thought to be 'ros' moor and 'dale', valley. But maybe it's from ross, i.e. russet or red, the colour of the trees - Who knows? Another perplexing one is Stockport, where I grew up. A port 40 miles from the sea, near the stocks perhaps? According to one explanation, Stockport is the 'market place at the outlying settlement' 'stoc' 'outlying settlement' and 'port' 'market'. Another says it's the 'monastery town', and yet another I saw as a child goes back to an earlier form, seen on on old maps, 'Stopford' - 'place where you stop at the ford'. Who's right? Streets, bridges, houses and forts provide clearer explanations, e.g Stretford - 'street', i.e. Roman street, 'on a ford', the ford across the River Mersey. Trafford is from the same origin, but without the 's' and the 't'. 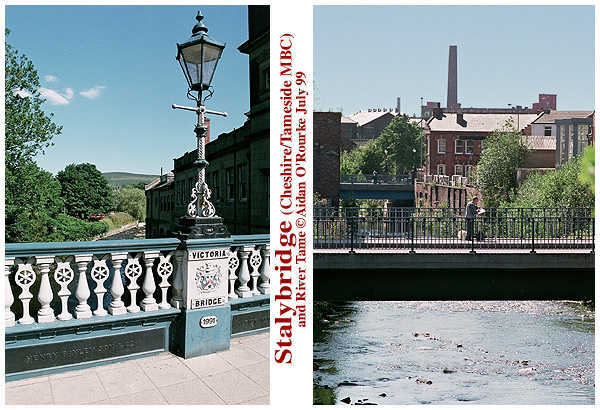 Stalybridge is the 'slaef léah brycg', the 'bridge by the wood whence the staves are procured'. Salford is the ford by the willow trees, and Manchester is, of course, the roman fort 'chester' named 'Mammucium', a Celtic origin word cognate with 'mamma', mother or breast, hence 'breast-shaped hill. The breast-shaped hill overlooked the confuence of the Medlock and Irwell, now Castlefield, and is obscured by canals, railway viaducts buildings and streets, so frustratingly, I can't compare how it might have looked with the real thing. Mancunio is apparenty a mis-spelling, but is used to describe people from this city, Mancunians. It's also used in the Irish Gaelic name for Manchester, Mancuin. Eccles is of Celtic origin, and means 'church'. The Celtic language borrowed from Latin 'ecclesia' giving Welsh 'eglwys' and Irish 'eaglas'. Other ecclesiastical place names include Prestwich - 'wic' farmstead of the priests. Prestolee is the 'léah' clearing, belonging to Priestall or hall of the priests. Prestbury, in Cheshire, is the 'burh' or fortification of the priests, Chadkirk, the chapel near Stockport is the church of Chad. There are many examples of 'chapel' in place names, including Chapeltown, 'town of the chapel' and Chapel-en-le-Frith in Derbyshire 'chapel in the sparse woodland'. The vast majority of local place names are pre-medieval in origin, but there are a few which date from more recent times. While places ening with '-ton' tend to be older, places ending in 'town' tend to be of much later origin such as Earlestown, near Warrington, built around the wagon works of the Liverpool to Manchester railway, and named after Sir Hardman Earle, director of the Liverpool to Manchester Railway Company. Boothstown appears also to be a later creation, though I'm not sure of the identity of Booth - can anyone help? In the city, new names have been created, for example Victoria Park, created in the 1830's as an enclosed residential district between Rusholme and Longsight. Even now after 150 years, it hasn't quite established itself to the extent of the much older neighbouring names and people erroneously talk about Edgar Wood Centre in 'Longsight', or the Manchester Central Mosque in 'Rusholme'. Chorlton-on-Medlock was once a town in its own right to the south of Manchester township - now Manchester University, MMU and UMIST have encroached on its territory, it's been rebuilt as an area of council housing, and High Street, once its bustling town centre, is no longer a focal point, and has been renamed Hathersage Road. The east Manchester districts of Bradford, Beswick, Holt Town and Openshaw lost much of their character with the death of the engineering industries, and are now often referred to as Eastlands - a name only a couple of letters away from 'wasteland', with connotations of emptiness and industrial decay. Let's hope the Commonwealth Games bring life and prosperity to this area again. In the 1980's, the former Manchester Docks became Salford Quays, now a futuristic business, residential and cultural district linked to the city centre by an ultra-modern tram system. In the city centre, old district names have died and new ones coined - Exchange, once used for the area around the old Cotton Exchange, was once a railway station, a telephone exchange and a destination on buses. When the monstrous Arndale Centre was opened in the 1970's, Arndale took over as a city centre bus destination. The bus station closed after the bomb in 1996. The most recent place name appear on city centre maps is the Northern Quarter, which refers to the old trading district north and east of Market Street and Piccadilly. The Gay Village, also known as The Village has emerged from the old warehouse district along Canal Street. Chinatown has taken over the area behind Piccadilly between Portland St and Mosley St, which was to have been demolished and redeveloped Piccadilly-Plaza-style in the 1960's. The very latest coining of a new district name is Peter's Fields, seen on Manchester City Council parking signs and presumably the idea of someone in the Town Hall. The name alludes to the 1817 massacre of demonstrators, and denotes the area around the Free Trade Hall, G-Mex (formerly Central Station) and the Bridgewater Hall. Churches have given their names to city districts, such St Georges, next to Hulme, Trinity in Salford, and All Saints, just south of the city centre. As we've seen, place names are often unclear in their origin, they can also be very imprecise in the area they refer to, none more so than the name 'Manchester'. For administrative purposes, Manchester refers only to the narrow sliver of land 12 miles long and four miles wide that is the City of Manchester. For people from outside the local area, Manchester means the conurbation, including the surrounding areas such as Tameside and Salford. Yet many people across the Irwell in Salford, or over the boundary in Stockport or Trafford, object to their areas being referred to as Manchester. But when I stand on Werneth Low, Hartshead Pike, Alderley Edge or Winter Hill, I see one vast, continuous conurbation and I think it should be called Manchester. Next time we're whizzing past a destination sign on the M60 motorway, or avoiding traffic jams using a computerised route finder, let's not forget our ancient ancestors in their forts, manor houses and farmsteads, whose descriptions of the land around them, and whose personal names live on in the place names familiar to us today. Simeon Potter 'Cheshire Place Names' Liverpool Historical Society of Lancashire and Cheshire 1955. Also, wherever I go I carry with me the Hutchinson Pocket book 'Dictionary of Place Names' by Adrian Room, published 1995 by Helicon Publishing Ltd. WARNING: The explanations of local place names given in this feature are not guaranteed as definitive. Some may be incorrect or of doubtful validity, so if you're serious about knowing the origin of your local place names, why not brush up on your Old English, Old Saxon or Old Norse and get along to the Central Library, the John Rylands Library or maybe Chethams Library and try your hand atresearching place name etymology yourself. It's fun!